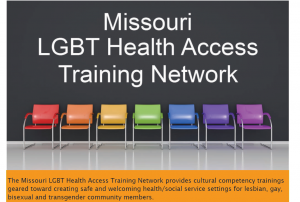 The Missouri LGBT Health Access Training Network provides cultural competency trainings geared toward creating safe and welcoming health/social service settings for lesbian, gay, bisexual, and transgender community members. Network Trainers have successfully completed a train-the-trainer program provided by the National LGBT Cancer Network. Trainings will be customized to meet the needs of your organization.